Villa Rica is surrounded by century old olive trees, lemon groves, orchards and mediterranean scrub and is only 7 kilometres from the sea. 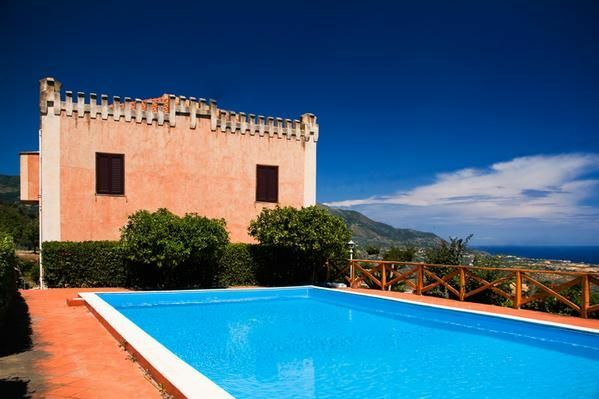 It is the ideal spot for a relaxing outdoor Sicilian holiday away from the “hum drum” of city life. It is a unique location. Not only is it the ideal place for a peaceful and relaxing stay but it is also an excellent starting point for visiting many of Sicily’s most beautiful sites. The Aeolian Islands, Taormina, Cefalù, Mount Etna and the Heritage Park of the Nebrodis can each be visited on a one day excursion. The restaurant is open to both guests and public. It has been renovated from the original oil and wine mill and the factor’s house. The building has kept its original features of typical Sicilian rural architecture (beamed roofs, local stones, floors tiled with “cotto siciliano”). The food is typical of the region and fresh organic fruit and vegetables from the farm itself are used as ingredients. - Towels: per person and week for rent at a price of 8 EUR (optional). Bed linen (per person and week, according to consumption 8 EUR). Cot (once per object, Costs amounting to 40 EUR). Towels (per person and week, according to consumption 8 EUR).